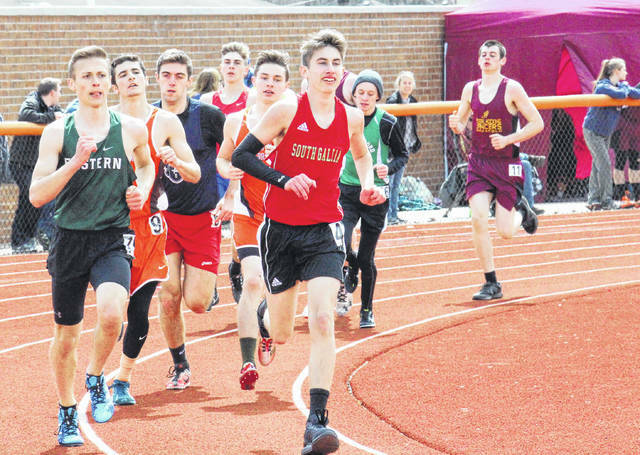 South Gallia’s Garrett Frazee (center) and Eastern’s Matt Clingenpeel (left) lead a pack of runner in the 1600m run, at the Rocky Brands Invitational on Saturday in Nelsonville, Ohio. 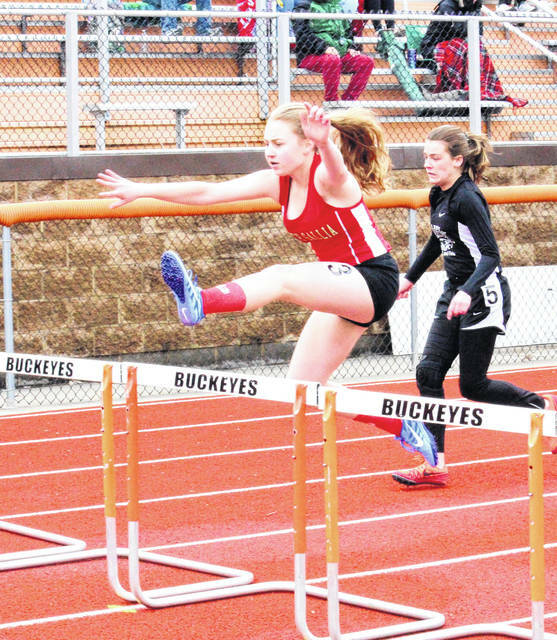 South Gallia’s Olivia Harrison runs in the 100m hurdles at the Rocky Brands Invitational on Saturday in Nelsonville, Ohio. NELSONVILLE, Ohio — Sending March out in style. On the final day of the third month, the Eastern girls track and field team won the small school team title at the Rocky Brands Invitational at Nelsonville-York’s Boston Field on Saturday. The Lady Eagles compiled a team total of 128, winning the small school division by 11 over Nelsonville-York. Fairfield Christian was third with 80, followed by Waterford (74), Belpre (73), Federal Hocking (43) and Fort Frye (36). Southern was eighth with a score of 35, while Miller (22) was ninth, Trimble (21) was 10th, South Gallia (16) was 11th and Nelsonville-York ‘B’ rounded out the 12-team field with two. The Lady Eagles won two individual events, with junior Ally Durst setting the pace in the 1600m run with a time of 5:58.49, and freshman Layna Catlett winning the discus with a throw of 108-10. Durst was also third in the 800m run with a time of 2:46.4, while Catlett claimed fourth in the shot put with a distance of 30-6. Eastern claimed second in two of the four relays, while finishing third in the other two. In the 4x800m relay, the team of Whitney Durst, Ally Durst, Rhiannon Morris and Ashton Guthrie was runner-up with a time of 11:18.28, while the quartet of Kylie Tolliver, Jaymie Basham, Morgain Little and Jenna Chadwell was second in the 4x100m relay with a time of 52.09. The 4x400m team of Guthrie, Jessica Cook, Ally Durst and Whitney Durst was third with a time of 4:50.93, while the team of Cook, Basham, Chadwell and Katlin Fick was third in the 4x200m relay with a time of 2:00.3. Fick placed second in the 100m hurdles with a time of 18.75, while finishing fourth in the pole vault at 7-00. Cook was second in the 400m dash with a time of 1:05.32, and 4th in the 800m run with a time of 2:46.86, while Morris was second in the 3200m run with a time of 13.56.4. Whitney Durst (6:18.9) was third in the 1600m run for the Lady Eagles, Little (20.51) was fourth in the 100m hurdles, while Chadwell (1:10.06) was fourth in the 400m dash. Southern’s lone champion on the day was Sydney Roush with a time of 13:35.83 in the 3200m run. Also for the Lady Tornadoes, Baylee Wolfe was third in the high jump at 4-6 and fourth in the long jump at 14-1.5. The Lady Rebels’ lone top-4 finisher was Olivia Harrison, who was third in the 100m hurdles with a time of 19.87. The girls large school division, featuring 13 teams, was won by Lancaster with a 145, followed by John Glenn with 93 and Wheelersburg with 91. Athens (89) was fourth, Warren (66) placed fifth, Parkersburg South (56) took sixth, Morgan (28) finished seventh, Washington Court House (24.5) was eighth, while Unioto (22) came in ninth. Meigs’ 19 points placed the Lady Marauders 10th, followed by Lancaster ‘B’ (15.5), Fairfield (11) and Parkersburg South ‘B’ (3). Meigs was led by Kassidy Betzing, who was second in the 100m dash with a time of 13.69, and third in the long jump with a distance of 17-2. The host Buckeyes won the boys small school division with a 169, followed by Belpre (111), Fort Frye (103) and Trimble (67). Eastern’s 49 points placed the Eagles fifth among 14 teams, while Miller (32) took sixth, Waterford (30) came in seventh and Federal Hocking (28) placed eighth. The Rebels were ninth with a score of 24, the Tornadoes took 10th with 19, followed by Nelsonville-York ‘B’ (17), Fairfield Christian (6), Trimble ‘B’ (3) and Belpre ‘B’ (1). The EHS boys also won a pair of individual events, with Noah Browning winning the 800m run with a time of 2:07.67 and Tyler Davis winning the discus with a throw of 123-4. Davis also picked up a runner-up finish in the shot put at 41-1, while Browning was fourth in the 100m dash with a time of 12.53. Also for the Eagles, Mason Dishong was third in the discus throw with a distance of 105-10. For South Gallia, Justin Butler was second in the 110m hurdles with a time of 18.91, while Kyle Northup was third in the high jump at 5-8. With a leap of 18-2.25, Trey McNickle was third in the long jump for the Tornadoes, while David Dunfee was fourth in the discus throw with a mark of 104-10. Lancaster also won the boys large school division with a 164, followed by Warren (86), Parkersburg (78) and Parkersburg South (67.5). Wheelersburg (60) was fifth of 16 teams, followed by John Glenn (51), Athens (29), Unioto (27) and Lancaster ‘B’ (25). The Marauders’ score of 21 placed them 10th, followed by Morgan (20), Washington Court House, Fisher Catholic (10), Fairfield (9), Parkersburg ‘B’ (2) and Parkersburg South ‘B’ (.5). Matthew Jackson was the highest finishing Marauder with a third place mark of 123-4 in the discus throw. Cole Adams took fourth in a pair of events for MHS, running the 100m dash in 11.92 and the 400m dash in 53.66. Visit www.baumspage.com for complete results of the Rocky Brands Invitational.